This figure shows selected leads from the initial ECG. There is a broad complex (QRS width of 0.16 seconds in Lead 1) regular tachycardia with a ventricular rate of about 214 beats per minute. There may be retrograde P waves in Lead II (a notch is seen on the upstroke of the S wave) and perhaps in Lead III (forming part of the R' wave). These deflection are a constant feature of each complex, and thus cannot represent atrioventricular (AV) dissociation. A right superior axis (from - 90 degrees to ± 180 degrees ) favours ventricular tachycardia. The combination of a right bundle branch block pattern wide complex tachycaria and an axis to the left of - 30 degrees favours ventricular tachycardia. The combination of a right bundle branch block pattern and a normal axis favours supraventricular tachycardia. In this case the aixs is assessed using the initial (0.04 seconds) QRS deflection. The axis is about - 20 degrees, which is leftward but still in the normal range. The QRS morphology in this case is a right bundle branch block, so the normal axis favours supraventricular tachycardia. Lead V1 is upright, with a rsR' shape. A predominately positive deflection in Lead V1 defines the tachcardia as a "Right Bundle Branch Block Patterm Wide Complex Tachycardia" (RBBB - WCT). A predominately downward deflection in Lead V1 defines the tachycardia as a "Left Bundle Branch Block Patterm Wide Complex Tachycardia" (LBBB - WCT). If all the QRS complexes in the V leads are predominately above the isoelectric line (tall R waves) then positive concordance is present. If all the QRS complexes in the V leads are predominately below the isoelectric line (deep QS waves) then negative concordance is present. The presence of concorance (positive or negative) suggests that ventricular tachycardia is the cause of the broad complex tachycardia. A monophasic R, a biphasic qR complex or a Rsr' shape (double-peaked R wave with the left peak taller than the right peak [also referred to as the rabbit ear sign: left rabbit ear taller than the right rabbit ear]) favour ventricular tachycardia as the cause of the broad complex tachycaria. These features are not seen in this case (suggesting that the broad complex tachycardia has a supraventricular origin). A small amplitude positive deflection followed by a larger amplitude negative deflection (rS morphology) favours the presence of ventricular tachycardia. In this case Lead V6 has a rS morphology, favouring ventricular tachycardia. A RBBB-WCT at a rate of about 214 beats per minute. Features that would clearly indicate the presence of ventricular tachycardia (AV dissociation, fusion beats, capture beats and concordance) are absent. Figure 2 shows selected leads from the second ECG. Sinus rhythm is present, with a ventricular rate of about 94 beats per minute. The PR interval is short at 0.12 seconds and delta waves are seen in the precordial leads. The ECG findings during sinus rhytm are due to the presence of a atrioventricular bypass tract that produces the Wolff-Parkinson-White (WPW) [ECG] pattern. Figure 3 shows that the ECG complexes in WPW are fusion beats formed by conduction through the usual pathway (the atria [1A], the atrioventricular node [AVN], the bundle of His  and the Purkinje system ) and an abnormal conduction path through the atria (1A) and the ventricles (2A) that is due to an accessory pathway (AP) that connects the atria and the ventricles. The dotted line ECG complex is the shape produced by normal conduction, and the solid line ECG complex shows the changes produced by conduction through the accessory pathway. Line 2A forms the delta wave. The AVN is shown as bridging the atria and the ventricles to simplify the illustration, but is actually located in the right atrium. The location of the bypass tract can be predicted from the morphology of the QRS complex in Lead V1. This shows a clockwise macro-reentry circuit in WPW involving the atrioventricular node (AVN) and the accessory pathway (blue rectangle) producing a narrow complex tachycardia. This is also called an orthodromic tachycardia. A counterckwise macro-reentry circuit in WPW involving the atrioventricular node (AVN) and the accessory pathway (blue rectangle) produces a wide complex tachycardia. This is also called a antidromic tachycardia. 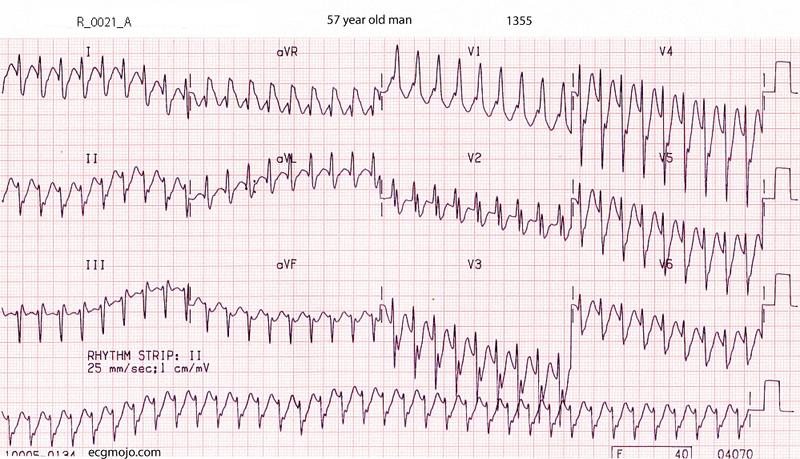 The development of a wide complex tachycardia when the baseline ECG has a WPW pattern is called the Wolff-Parkinson-White syndrome. ECG during tachycardia (first tracing at 1355): A RBBB type wide complex tachycardia with some morphological features that favour ventricular tachycardia as the cause. Other features suggest suprventricular tachycardia and aberrant conduction as the cause. Comparison of the second ECG with the first ECG establishes that the wide complex tachycardia is due to an antidromic tachycardia involving the bypass tract i.e. Wolff-Parkinson-White syndrome.